For other uses, see Fast food (disambiguation). The fastest form of "fast food" consists of pre-cooked meals kept in readiness for a customer's arrival (Boston Market rotisserie chicken, Little Caesars pizza, etc. ), with waiting time reduced to mere seconds. Other fast food outlets, primarily the hamburger outlets (McDonald's, Burger King, etc.) use mass-produced pre-prepared ingredients (bagged buns & condiments, frozen beef patties, prewashed/sliced vegetables, etc.) but take great pains to point out to the customer that the "meat and potatoes" (hamburgers and french fries) are always cooked fresh (or at least relatively recently) and assembled "to order" (like at a diner). Although a vast variety of food can be "cooked fast", "fast food" is a commercial term limited to food sold in a restaurant or store with frozen, preheated or precooked ingredients, and served to the customer in a packaged form for take-out/take-away. Eating fast food has been linked to, among other things, colorectal cancer, obesity, high cholesterol, and depression. Many fast foods tend to be high in saturated fat, sugar, salt and calories. The concept of ready-cooked food for sale is closely connected with urban developments. Homes in emerging cities often lacked adequate space or proper food preparation accouterments. Additionally, procuring cooking fuel could cost as much as purchased produce. Frying foods in vats of searing oil proved as dangerous as it was expensive, and homeowners feared that a rogue cooking fire "might easily conflagrate an entire neighborhood". Thus, urbanites were encouraged to purchase pre-prepared meats or starches, such as bread or noodles, whenever possible. In Ancient Rome, cities had street stands – a large counter with a receptacle in the middle from which food or drink would have been served. It was during post-WWII American economic boom that Americans began to spend more and buy more as the economy boomed and a culture of consumerism bloomed. As a result of this new desire to have it all, coupled with the strides made by women while the men were away, both members of the household began to work outside the home. Eating out, which had previously been considered a luxury, became a common occurrence, and then a necessity. Workers, and working families, needed quick service and inexpensive food for both lunch and dinner. This need is what drove the phenomenal success of the early fast food giants, which catered to the family on the go (Franklin A. Jacobs). [clarification needed] Fast food became an easy option for a busy family, as is the case for many families today. In the cities of Roman antiquity, much of the urban population living in insulae, multi-story apartment blocks, depended on food vendors for much of their meal; the Forum itself served as a marketplace where Romans could purchase baked goods and cured meats. In the mornings, bread soaked in wine was eaten as a quick snack and cooked vegetables and stews later in popina, a simple type of eating establishment. In Asia, 12th century Chinese scarfed down fried dough, soups, and stuffed buns, all of which still exist as contemporary snack food. Their Baghdadi contemporaries supplemented home-cooked meals with processed legumes, purchased starches, and even ready-to-eat meats. During the Middle Ages, large towns and major urban areas such as London and Paris supported numerous vendors that sold dishes such as pies, pasties, flans, waffles, wafers, pancakes and cooked meats. As in Roman cities during antiquity, many of these establishments catered to those who did not have means to cook their own food, particularly single households. Unlike richer town dwellers, many often could not afford housing with kitchen facilities and thus relied on fast food. Travelers such as pilgrims en route to a holy site, were among the customers. In areas with access to coastal or tidal waters, 'fast food' frequently included local shellfish or seafood, such as oysters or, as in London, eels. Often this seafood was cooked directly on the quay or close by. The development of trawler fishing in the mid-nineteenth century led to the development of a British favourite, fish and chips, and the first shop in 1860. A blue plaque at Oldham's Tommyfield Market marks the origin of the fish and chip shop and fast food industries. As a cheap fast food served in a wrapper, fish and chips became a stock meal among the Victorian working classes. By 1910, there were more than 25,000 fish and chip shops across the UK, and in the 1920s there were more than 35,000 shops. Harry Ramsden's fast food restaurant chain opened its first fish and chip shop in Guiseley, West Yorkshire in 1928. On a single day in 1952, the shop served 10,000 portions of fish and chips, earning a place in the Guinness Book of Records. British fast food had considerable regional variation. Sometimes the regionality of a dish became part of the culture of its respective area, such as the Cornish pasty and deep-fried Mars bar. The content of fast food pies has varied, with poultry (such as chickens) or wildfowl commonly being used. Since the Second World War, turkey has been used more frequently in fast food. The UK has adopted fast food from other cultures as well, such as pizza, doner kebab, and curry. More recently, healthier alternatives to conventional fast food have also emerged. Neighboring fast food restaurant advertisement signs in Bowling Green, Kentucky for Wendy's, KFC, Krystal and Taco Bell. A McDonald's sign can be seen in the very far background. As automobiles became popular and more affordable following World War I, drive-in restaurants were introduced. The American company White Castle, founded by Billy Ingram and Walter Anderson in Wichita, Kansas in 1921, is generally credited with opening the second fast food outlet and first hamburger chain, selling hamburgers for five cents each. Walter Anderson had built the first White Castle restaurant in Wichita in 1916, introducing the limited menu, high-volume, low-cost, high-speed hamburger restaurant. Among its innovations, the company allowed customers to see the food being prepared. White Castle was successful from its inception and spawned numerous competitors. Franchising was introduced in 1921 by A&W Root Beer, which franchised its distinctive syrup. Howard Johnson's first franchised the restaurant concept in the mid-1930s, formally standardizing menus, signage and advertising. 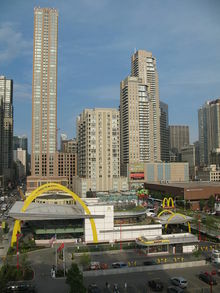 McDonald's first two-lane drive-thru was at the Rock N Roll McDonald's in Chicago. Fast food outlets are take-away or take-out providers that promise quick service. Such fast food outlets often come with a "drive-through" service that lets customers order and pick up food from their vehicles. Others have indoor or outdoor seating areas where customers can eat on-site. In recent times, the boom in IT services has allowed customers to order food from their homes through their smart phone apps. Nearly from its inception, fast food has been designed to be eaten "on the go," often does not require traditional cutlery, and is eaten as a finger food. Common menu items at fast food outlets include fish and chips, sandwiches, pitas, hamburgers, fried chicken, french fries, onion rings, chicken nuggets, tacos, pizza, hot dogs, and ice cream, though many fast food restaurants offer "slower" foods like chili, mashed potatoes, and salads. Convenience stores located within many petrol/gas stations sell pre-packaged sandwiches, doughnuts, and hot food. Many gas stations in the United States and Europe also sell frozen foods, and have microwave ovens on the premises in which to prepare them. Petrol Stations in Australia sell foods such as hot pies, sandwiches, and chocolate bars, which are easy for a customer to access while on their journey. Petrol stations are a place that are often open long hours and are open before and after shop trading hours therefore it makes it easy to access for consumers. Fastfood restaurant in Eastern Europe: The Pajdaš (in Prekmurje dialect Buddy), Murska Sobota Slovenia. Traditional street food is available around the world, usually through small and independent vendors operating from a cart, table, portable grill or motor vehicle. Common examples include Vietnamese noodle vendors, Middle Eastern falafel stands, New York City hot dog carts, and taco trucks. Turo-Turo vendors (Tagalog for point point) are a feature of Philippine life. Commonly, street vendors provide a colorful and varying range of options designed to quickly captivate passers-by and attract as much attention as possible. 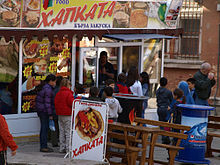 Depending on the locale, multiple street vendors may specialize in specific types of food characteristic of a given cultural or ethnic tradition. In some cultures, it is typical for street vendors to call out prices, sing or chant sales-pitches, play music, or engage in other forms of "street theatrics" to engage prospective customers. In some cases, this can garner more attention than the food. Modern commercial fast food is often highly processed and prepared in an industrial fashion, i.e., on a large scale with standard ingredients and standardized cooking and production methods. It is usually rapidly served in cartons or bags or in a plastic wrapping, in a fashion that minimizes cost. In most fast food operations, menu items are generally made from processed ingredients prepared at a central supply facility and then shipped to individual outlets where they are reheated, cooked (usually by microwave or deep frying) or assembled in a short amount of time. This process ensures a consistent level of product quality, and is key to being able to deliver the order quickly to the customer and eliminate labor and equipment costs in the individual stores. Because of commercial emphasis on quickness, uniformity and low cost, fast food products are often made with ingredients formulated to achieve a certain flavor or consistency and to preserve freshness. Chinese takeaways/takeout restaurants are particularly popular in Western countries such as the US and UK. They normally offer a wide variety of Asian food (not always Chinese), which has normally been fried. Most options are some form of noodles, rice, or meat. In some cases, the food is presented as a smörgåsbord, sometimes self service. The customer chooses the size of the container they wish to buy, and then is free to fill it with their choice of food. It is common to combine several options in one container, and some outlets charge by weight rather than by item. In large cities, these restaurants may offer free delivery for purchases over a minimum amount. Sushi has seen rapidly rising popularity recently in the Western world. A form of fast food created in Japan (where bentō is the Japanese variety of fast food), sushi is normally cold sticky rice flavored with a sweet rice vinegar and served with some topping (often fish), or, as in the most popular kind in the West, rolled in nori (dried laver) with filling. The filling often includes fish, seafood, chicken or cucumber. Pizza is a common fast food category in the United States, with nationwide chains including Papa John's, Domino's Pizza, Sbarro and Pizza Hut. It trails only the burger industry in supplying children's fast food calories. Menus are more limited and standardized than in traditional pizzerias, and pizza delivery is offered. Kebab houses are a form of fast food restaurant from the Middle East, especially Turkey and Lebanon. Meat is shaven from a rotisserie, and is served on a warmed flatbread with salad and a choice of sauce and dressing. These doner kebabs or shawarmas are distinct from shish kebabs served on sticks. Kebab shops are also found throughout the world, especially Europe, New Zealand and Australia but they generally are less common in the US. 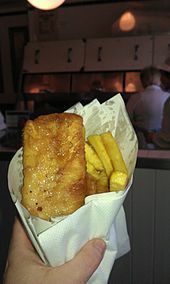 Fish and chip shops are a form of fast food popular in the United Kingdom, Australia and New Zealand. Fish is battered and then deep fried, and served with deep fried potato strips. The Dutch have their own types of fast food. A Dutch fast food meal often consists of a portion of french fries (called friet or patat) with a sauce and a meat product. The most common sauce to accompany french fries is fritessaus. It is a sweet, vinegary and low fat mayonnaise substitute, that the Dutch nevertheless still call "mayonnaise". When ordering it is very often abbreviated to met (literally "with"). Other popular sauces are ketchup or spiced ketchup ("curry"), Indonesian style peanut sauce ("satésaus" or "pindasaus") or piccalilli. Sometimes the fries are served with combinations of sauces, most famously speciaal (special): mayonnaise, with (spiced) ketchup and chopped onions; and oorlog (literally "war"): mayonnaise and peanut sauce (sometimes also with ketchup and chopped onions). The meat product is usually a deep fried snack; this includes the frikandel (a deep fried skinless minced meat sausage), and the kroket (deep fried meat ragout covered in breadcrumbs). 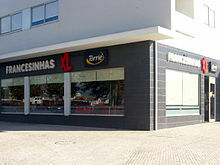 In Portugal, there are some varieties of local fast-food and restaurants specialized in this type of local cuisine. Some of the most popular foods include frango assado (Piri-piri grilled chicken previously marinated), francesinha, francesinha poveira, espetada (turkey or pork meat on two sticks) and bifanas (pork cutlets in a specific sauce served as a sandwich). This type of food is also often served with french fries (called batatas fritas), some international chains started appearing specialized in some of the typical Portuguese fast food such as Nando's. An example of a local form of fast food in Poland is pasztecik szczeciński, a deep-fried yeast dough stuffed with meat or vegetarian filling, typical fast food dish of the city of Szczecin well known in many other cities in the country. A dish is on Polish List of traditional products. 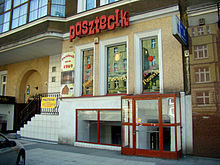 The first bar serving pasztecik szczeciński, Bar "Pasztecik" founded in 1969, is located on Wojska Polskiego Avenue 46 in Szczecin. A fixture of East Asian cities is the noodle shop. Flatbread and falafel are today ubiquitous in the Middle East. Popular Indian fast food dishes include vada pav, panipuri and dahi vada. In the French-speaking nations of West Africa, roadside stands in and around the larger cities continue to sell—as they have done for generations—a range of ready-to-eat, char-grilled meat sticks known locally as brochettes (not to be confused with the bread snack of the same name found in Europe). In the United States, consumers spent $160 billion on fast food in 2012 (up from $6 billion in 1970). In total the US restaurant industry had projected sales of $660.5 billion in 2013. Fast food has been losing market share to fast casual dining restaurants, which offer more robust and expensive cuisines. Due to this competition, fast food giants have seen dramatic drops in their sales. While overall fast food sales have fallen, the number of Americans who eat in these restaurants "once a month or 'a few times a year'" has risen. In contrast to the rest of the world, American citizens spend a much smaller amount of their income on food — largely due to various government subsidies that make fast food cheap and easily accessible. Calorie for calorie, foods sold in fast food restaurants, costs less and is more energy-dense, and is made mostly of products that the government subsidizes heavily: corn, soy, and beef. The Australian fast food market is valued at more than 2.7 billion GPB and is composed of 1.4 billion fast food meals. This includes meals serviced at 17,000 fast food outlets. The fast food market has experienced an average annual growth rate of 6.5 percent, which is the most rapidly growing sector of the retail food market. In 2012, fast food restaurants spent roughly US$4.6 billion on advertising campaigns, which represented an 8% increase from 2009. In the same period of time, McDonald's spent nearly 3 times as much on advertising as all water, milk, and produce advertisers spent combined. A study done by researchers from the Geisel School of Medicine at Dartmouth College saw results that suggest that when children watch more commercial television (and see more advertisements on fast food), they are more inclined to ask to visit these subsequent fast food restaurants. Specifically, fast food restaurants have been increasing their advertising efforts that target black and Hispanic youth. Advertising on Spanish speaking channels increased by 8% in 2012, with KFC and Burger King increasing spending in this demographic by 35% while cutting down on their regular advertising within English speaking channels. The Council of Better Business Bureaus started the Children's Food and Beverage Advertising Initiative in 2006 which asked fast food companies to pledge to "advertise only more healthful products to children" with McDonald's and Burger King signing on. However, despite a slight increase in healthful food advertising, the effectiveness of this initiative has been disputed by studies that reveal that "children couldn't remember or identify healthful foods in the ads, and that 81 percent of the 99 3 to 7 year olds in that study recalled French fries" even though there were no French fries in the advertisement. According to the U.S. Bureau of Labor Statistics, about 4.1 million U.S. workers are employed in food preparation and serving (including fast food) as of 2010. The BLS's projected job outlook expects average growth and excellent opportunity as a result of high turnover. However, in April 2011, McDonald's hired approximately 62,000 new workers and received a million applications for those positions—an acceptance rate of 6.2%. The median age of workers in the industry in 2013 was 28. Obtaining Human Resource Management diploma or diploma in Fast Food Management can help to get a job in major fast food restaurants since it is one of the most desired. The employment rate for Australians working in the fast food industry is increasingly high, with 17% of people working within the fast food sector in Australia. In 2006, the global fast-food market grew by 4.8% and reached a value of £102.4 billion and a volume of 80.3 billion transactions. McDonald's alone, has outlets in 126 countries on 6 continents and operates over 31,000 restaurants worldwide. 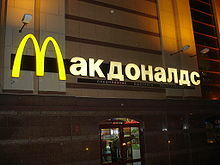 One example of McDonald's expansion on a global scale was its introduction to the Russian market. In order for the American business to succeed it would have to be accepted and integrated into the daily lives of natives in Moscow. Thus, the restaurant was strategically implemented so that its offerings would align with the distinct and established eating habits, also known as the customs around food, eating and cooking, of Muscovites. One significant characteristic of Russian food culture is the emphasis on knowing about the locality of goods that are consumed. Essentially, in order to successfully launch this American brand in a foreign country, McDonald's interpreted the local interests of consumers in Moscow by promoting the origins of the produce used in the restaurant. On January 31, 1990 McDonald's opened a restaurant in Moscow and broke opening-day records for customers served. The Moscow restaurant is the busiest in the world. There are numerous other fast food restaurants located all over the world. Burger King has more than 11,100 restaurants in more than 65 countries. KFC is located in 25 countries. Subway is one of the fastest growing franchises in the world with approximately 39,129 restaurants in 90 countries as of May 2009, the first non-US location opening in December 1984 in Bahrain. Wienerwald has spread from Germany into Asia and Africa. 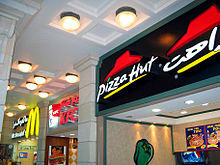 Pizza Hut is located in 97 countries, with 100 locations in China. Taco Bell has 278 restaurants located in 14 countries besides the United States. Fast-food chains have come under criticism over concerns ranging from claimed negative health effects, alleged animal cruelty, cases of worker exploitation, and claims of cultural degradation via shifts in people's eating patterns away from traditional foods. The intake of fast food is increasing worldwide. A study done in the city of Jeddah has shown that current fast-food habits are related to the increase of overweight and obesity among adolescents in Saudi Arabia. In 2014, the World Health Organization published a study which claims that deregulated food markets are largely to blame for the obesity crisis, and suggested tighter regulations to reverse the trend. In the United States, local governments are restricting fast food chains by limiting the number of restaurants found in certain geographical areas. To combat criticism, fast-food restaurants are starting to offer more health-friendly menu items. In addition to health critics, there are suggestions for the fast-food industry to become more eco-friendly. The chains have responded by "reducing packaging waste". Although trying to overcome criticism through healthy options on fast food menus, Marion Nestle, who serves as the chair of New York University's Department of Nutrition and Food Studies, suggests that fast-food industries intentionally market unhealthy foods to children through advertising options and therefore create customers for life. Despite so much popularity, fast foods and fast-food chains have adverse impacts not only on the job and social skills, but on the health and academic performance of students. Fifty-six percent of students consume fast food on a weekly basis. The researcher who wrote Fast Food Nation, Eric Schlosser, highlights this fact, arguing that this is not only a financial but also a psychological bait, in that the students are lured towards this early employment opportunity knowing little that the time spent on this no-skill-learning job is wasted. Two other researchers, Charles Hirschman and Irina Voloshin, highlight their dangerous impacts and consequences regarding hiring and firing of teenage school-goers in the fast-food industry. Kelly Brownwell of The Atlantic Times has further supported this argument that another dangerous practice was adopted by Burger King and McDonald's for marketing to the innocent children. In a research study conducted by Professors Purtell Kelly and Gershoff, they found that the students of fifth grades, who ate fast foods as compared to the students of the same age after some other social factors were controlled. [clarification needed] Also, the percentage of the students having consumed fast food and showed poor grades was around 11 percent more than those who used organic foods. They are of the view that other social factors such as television watching, video games and playing were controlled to assess the real impacts of the fast foods. There have been books and films, such as the 2004 film Super Size Me, designed to highlight the potential negative health effects from the overconsumption of fast food such as its contribution to obesity. ^ Jakle, John (1999). Fast Food: Roadside Restaurants in the Automobile Age. Johns Hopkins University Press. ISBN 978-0-8018-6920-4. ; Brueggemann, Walter (1993). Texts Under Negotiation: The Bible and Postmodern Imagination. Fortress Press. ISBN 978-0-8006-2736-2. ^ Talwar, Jennifer (2003). Fast Food, Fast Track: Immigrants, Big Business, and the American Dream. Westview Press. ISBN 978-0-8133-4155-2. ^ "The link between fast food and depression has been confirmed". EurekAlert!. Retrieved April 22, 2018. ^ Pietrangelo, Ann; Carey, Elea. "13 Effects of Fast Food on the Body". Healthline. Retrieved March 20, 2016. ^ "Susan Cohan Colon Cancer Foundation: Prevention: Eating Well/Diet". coloncancerfoundation.org. Archived from the original on October 18, 2016. Retrieved August 16, 2016. ^ Publications, Harvard Health. "Red meat and colon cancer – Harvard Health". Retrieved August 16, 2016. ^ Hellesvig-Gaskell, Karen. "Definition of Fast Foods | LIVESTRONG.COM". LIVESTRONG.COM. Retrieved May 3, 2016. ^ Jaworowska, Agnieszka; Blackham, Toni; Davies, Ian G.; Stevenson, Leonard (May 1, 2013). "Nutritional challenges and health implications of takeaway and fast food". Nutrition Reviews. 71 (5): 310–318. doi:10.1111/nure.12031. ISSN 0029-6643. PMID 23590707. ^ Laudan, Rachel (2001). "A Plea for Culinary Modernism: Why We Should Love New, Fast, Processed Food". Gastronomica: The Journal of Critical Food Studies. 1: 36–44. ^ "Ancient Romans preferred fast food". ABC Science. June 19, 2007. Retrieved June 30, 2016. ^ Dupont, Florence (1992). Daily Life in Ancient Rome. Oxford: Blackwell. p. 181. ^ Stambaugh, John E. (1988). The Ancient Roman City. JHU Press. pp. 200, 209. ISBN 978-0-8018-3692-3. ^ Chang, Kwang-chih (1977). Food in Chinese Culture: Anthropological and Historical Perspectives. New Haven: Yale University Press. ^ Le Strange, G. (1924). Baghdad during the Abbasid Caliphate from Contemporary Arabic and Persian Sources, 81–82. London: Oxford University Press. pp. 81–82. ^ Carling, Martha (2003). Food and Eating in Medieval Europe. Bloomsbury Academic. pp. 27–51. ISBN 978-1-85285-148-4. ^ BBC (August 31, 2006). "Eel and pie shop". BBC. Retrieved November 24, 2007. ^ a b c Webb, Andrew (2011). Food Britannia. Random House. p. 397. ^ Alexander, James (December 18, 2009). "The unlikely origin of fish and chips". BBC News. Retrieved July 16, 2013. ^ BBC News (February 7, 2007). "How turkey became a fast food". BBC. Retrieved November 23, 2007. ^ National Public Radio (2002). "The Hamburger". NPR. Archived from the original on December 22, 2007. Retrieved November 23, 2007. ^ a b James P Farrell. "The Evolution of the Quick Service Restaurant". A Management Consultant @ Large. Retrieved February 14, 2008. ^ Mcginley, Lou Ellen (2004). Honk for Service, a Man, a Tray, and the Glory Days of the Drive-in. Tray Days Publishing. ISBN 978-0-615-12697-5. ^ a b "BLS.gov: Food and Beverage Serving and Related Workers". December 17, 2015. Retrieved April 6, 2016. ^ Smith, Lindsey P.; Ng, Shu Wen; Popkin, Barry M. (May 1, 2014). "Resistant to the recession: low-income adults' maintenance of cooking and away-from-home eating behaviors during times of economic turbulence". American Journal of Public Health. 104 (5): 840–846. doi:10.2105/AJPH.2013.301677. ISSN 1541-0048. PMC 3987573. PMID 24625145. ^ Tami Abdollah (September 10, 2007). "A strict order for fast food". Los Angeles Times. ^ "Super-Sizing public costs: How Low Wages at Top Fast-Food Chains Leave Taxpayers Footing the Bill" (PDF). National Employment Law Project. October 2013. Retrieved May 22, 2015. ^ Maclay, Kathleen (October 15, 2013). "Fast Food, Poverty Wages: The Public Cost of Low-wage jobs in the Fast Food Industry" (PDF). University of California Labor Center. ^ "Federation of Fish Friers – Serving the Fish and Chips Industry – History". Retrieved May 24, 2015. ^ "Fast Food Industry Analysis 2015 – Cost & Trends". Retrieved May 24, 2015. ^ Schlosser, Eric (2001). Fast Food Nation: The Dark Side of the All-American Meal. Houghton Mifflin Books. ISBN 978-0-395-97789-7. ^ "NRA Pocket Factbook" (PDF). National Restaurant Association. 2013. Retrieved April 6, 2016. ^ John Eligon (January 13, 2008). "Where to Eat? A New Restaurant Genre Offers Manhattan More Choices". The New York Times. Retrieved December 30, 2008. Though still a relatively small sector within the nation's $350 billion restaurant industry, several fast-casual chains are showing success and growth in Manhattan, and industry experts say it could be a sign of the sector's maturity and sustainability nationwide. ^ "Commodity Policy and Agricultural Subsidies". Yale Rudd Center for Food Policy and Obesity. January 1, 2013. Retrieved August 18, 2014. ^ Parker-Pope, Tara (December 5, 2007). "A High Price for Healthy Food". The New York Times. Retrieved August 17, 2014. ^ Cameron Allan; Greg J. Bamber; Nils Timo (September 1, 2006). "Fast‐food work: are McJobs satisfying?". Employee Relations. 28 (5): 402–420. doi:10.1108/01425450610683627. ISSN 0142-5455. ^ University, Yale. "Fast Food FACTS — Fast Food Facts in Brief". www.fastfoodmarketing.org. Retrieved April 18, 2017. ^ a b Dell’Antonia, KJ. "More Research Suggests Fast-Food Advertising Works on Children". Motherlode Blog. The New York Times. Retrieved April 18, 2017. ^ Bernhardt, Amy M.; Wilking, Cara; Gottlieb, Mark (May 2014). "Children's Reaction to Depictions of Healthy Foods in Fast-Food Television Advertisements". JAMA Pediatrics. 168 (5): 422–426. doi:10.1001/jamapediatrics.2014.140. Retrieved April 20, 2017. ^ "It's Harder To Get A Job At McDonald's Than It Is To Get Into Harvard". Business Insider. April 28, 2011. Retrieved May 24, 2015. ^ Owens, Christine (August 29, 2013). "Trying to raise a family on a fast-food salary". Reuters. Retrieved April 8, 2016. ^ "Fast Food Job Applications". ^ "Our Life Policy Research Notes on takeaways – The UK fast-food market" (PDF). Archived from the original (PDF) on January 14, 2013. Retrieved July 28, 2012. ^ "The Fast Food Factory". ^ Caldwell, Melissa L. "Domesticating the French Fry: McDonald’s and Consumerism in Moscow." Journal of Consumer Culture 4.1 (2004): 5-26. Web. January 30, 2017. ^ "World's Largest McDonald's in Orlando, FL". Retrieved May 24, 2015. ^ Subway publication (2008). "Official SUBWAY Restaurants Web Site". Subway Restaurants. Retrieved May 24, 2009. ^ "Wienerwald – Türkiye – Restoranlar". Archived from the original on May 23, 2015. Retrieved May 24, 2015. ^ "WIENERWALD – Restaurants in Egypt". Retrieved May 24, 2015. ^ Jeffery, Robert (January 25, 2006). "Are fast food restaurants an environmental risk factor for obesity?". International Journal of Behavioral Nutrition and Physical Activity. 3: 2. doi:10.1186/1479-5868-3-2. PMC 1397859. PMID 16436207. ^ Freeman, Andrea (December 6, 2007). "Fast Food: Oppression through Poor Nutrition". California Law Review. 95 (6): 2221–2259. JSTOR 20439143. ^ Ronald, Adams (September 8, 2008). "Fast Food and Animal Rights: An Examination and Assessment of the Industry's Response to Social Pressure". Business and Society Review. 113 (3): 301–328. doi:10.1111/j.1467-8594.2008.00322.x. ^ Singer, Peter and Mason, Jim. "The Ethics of What We Eat: Why Our Food Choices Matter". Holtzbrink Publishers. 2006. ^ Singer, P (1975). Animal liberation. ISBN 978-0-394-40096-9. ^ Smith, Vicki (November 4, 1998). "The Fractured World of the Temporary Worker: Power, Participation, and Fragmentation in the Contemporary Workplace". Social Problems. 45 (4): 411–430. doi:10.2307/3097205. JSTOR 3097205. ^ Duffey, Kiyah (January 2007). "Differential associations of fast food and restaurant food consumption with 3-y change in body mass index: the Coronary Artery Risk Development in Young Adults Study". The American Journal of Clinical Nutrition. Retrieved April 8, 2016. ^ French, Simone (May 2001). "Environmental Influences on Eating and Physical Activity". Annual Review of Public Health. 22: 309–35. doi:10.1146/annurev.publhealth.22.1.309. PMID 11274524. ^ Michelle M. Mello, Eric B. Rimm and David M. Studdert. "The McLawsuit: The Fast-Food Industry And Legal Accountability For Obesity". Health Affairs. November 2003. vol. 22 no. 6 207-216. .
^ Hossein Rouhani, Mohammad; Mirseifinezhad, Maryam; Omrani, Nasrin; Esmaillzadeh, Ahmad; Azadbakht, Leila (2012). "Fast Food Consumption, Quality of Diet, and Obesity among Isfahanian Adolescent Girls". Journal of Obesity. 2012: 597924. ^ A. Washi, Sidiga; Maha B. Ageib (2010). "Poor diet quality and food habits are related to impaired nutritional status in 13- to 18-year-old adolescents in Jeddah". Nutrition Research. 30 (8): 527–34. doi:10.1016/j.nutres.2010.07.002. PMID 20851306. ^ Study finds deregulation fuelling obesity epidemic. Reuters. February 2, 2014. Retrieved March 6, 2014. ^ Nestle, Marion (2002). Food Politics: How the Food Industry Influences Nutrition and Health. Berkeley: University of California Press. ^ Schlosser, Eric. Fast Food Nation. The Dark Side of All American Meals. Mariner Books. New York. 2012. Print. ^ Hirschman, Charles, and Irina Voloshin. "The Structure of Teenage Employment: Social Background and the Jobs Held by High School Seniors." Research in social stratification and mobility 25.3 (2007): 189–203. National Center for Biotechnology Information. Web. November 13, 2015. ^ Brownwell, Kelly. "Are Children Prey for Fast Food Companies?" The Atlantic. The Atlantic. November 8, 2008. Web. November 13, 2015. ^ Purtell, K. M.; Gershoff, E. T. (2014). "Fast Food Consumption and Academic Growth in Late Childhood". Clinical Pediatrics. 54 (9): 871–77. doi:10.1177/0009922814561742. PMID 25480321. ^ Brindal, Emily; Mohr, Philip; Wilson, Carlene; Wittert, Gary (July 1, 2008). "Obesity and the effects of choice at a fast food restaurant". Obesity Research & Clinical Practice. 2 (2): 111–117. doi:10.1016/j.orcp.2008.03.004. ISSN 1871-403X. Adams, Catherine (2007). "Reframing the Obesity Debate: McDonald's Role May Surprise You". Journal of Law, Medicine and Ethics. 35 (1): 154–157. doi:10.1111/j.1748-720X.2007.00120.x. PMID 17341224. Kroc, Ray with Robert Anderson. Grinding It Out: The Making of McDonald's. St. Martin's Press, 1992. Warner, Melanie "Salads or No, Cheap Burgers Revive McDonald's." The New York Times April 19, 2006.